The digestive tract is really a simple system. A long tube open at the top and bottom. Food goes in the mouth, it travels along as if on a conveyor belt, nutrients are extracted, and the non usable waste is eliminated out the rear end. If you read no further, get this point: Nutrients can not come into the body unless the food is digested (broken down). Digestion is the process by which food as we eat it is broken down into chemical substances that can be assimilated (taken into) the body. Almost all foods, whether it is a sugar, carbohydrate, or a protein, must be digested before it can be assimilated and utilized. It is the end product of digestion that is used to build and nourish cells and provide energy (fuel) for the body to function. 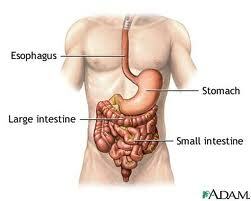 Digestion begins in the mouth and is completed in the small intestine. The process is the same for dogs, cats, horses, and people. 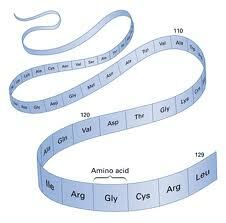 Proteins are made up of one or more chains of amino acids. In order for the body to utilize the amino acids in the protein, the protein must be cleaved into individual amino acids. The individual amino acids are absorbed from the intestines, carried by the blood stream to the liver where the liver warehouses the amino acids. When particular amino acids are needed to build and repair, the liver is signaled to construct the new protein and deliver it where it is needed. Proteins are fundamental components of all living cells and include many substances, such as enzymes, hormones, and antibodies. They are essential in the diet of animals for the growth and repair of tissue and can be obtained from foods such as meat, fish, eggs, milk, and legumes. Carbohydrates include bread, potatoes, pastries, candy, rice, spaghetti, fruits, and vegetables. 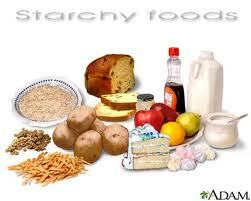 Many of these foods contain both starch (which can be digested), and fiber (which the body cannot digest). The digestible carbohydrates are broken into simpler molecules by enzymes in the saliva, in juice produced by the pancreas, and in the lining of the small intestine. Starch is digested in two steps: First, enzymes in the saliva and pancreatic juices break the starch into molecules called maltose. Enzymes in the lining of the small intestine (maltase) splits the maltose into glucose molecules that can be absorbed into the blood. Glucose is then carried through the bloodstream to the liver, where it is stored or used to provide energy for the work of the body. Table sugar, a type of carbohydrate, must be digested to be useful. Enzymes digest table sugar into glucose and fructose, each of which can be absorbed from the intestinal cavity into the blood. Milk contains a sugar called lactose, which must be digested by an enzyme called lactase. Healthy fats are important to maintain a healthy body. 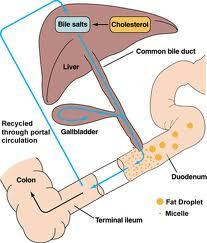 Fat digestion begins with the mixing of bile acids (which are produced by the liver) with the fat. The bile acts as natural detergents to dissolve fat in water and allow the enzymes to break the large fat molecules into smaller molecules like fatty acids and cholesterol. The bile acids combine with the fatty acids and cholesterol and help these molecules move into the cells of the mucosa. In the mucosal cells the small molecules are formed back into large molecules, and then are carried by the blood to storage depots in different parts of the body. 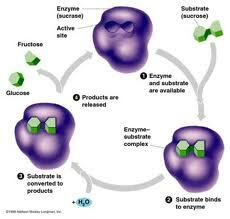 By now it should be clear that enzymes play a crucial role in the digestive process. When food is not digested, it can lead to inflammation and serious health issues.